The RAP-B-166-UN7U by RAM Mounts consists of a 3.3" diameter suction cup twist lock base, double socket system and universal spring loaded X-Grip® cradle for cell phones. The suction cup, twist lock base is designed to have a strong hold on glass and non-porous plastic surfaces, including adhesive disks. The mount is designed with a RAM 1" diameter patented rubber ball and socket system that has adjustment points at both ends of the double socket arm; this allowing for almost infinite adjustment and perfect viewing angles. The included X-Grip® cradle has a clean and clever four leg design that sports great holding power without hiding your phone behind foam pads and plastic. The spring loaded X-Grip® cradle expands and contracts, allowing for a perfect custom fit of your cell phone. 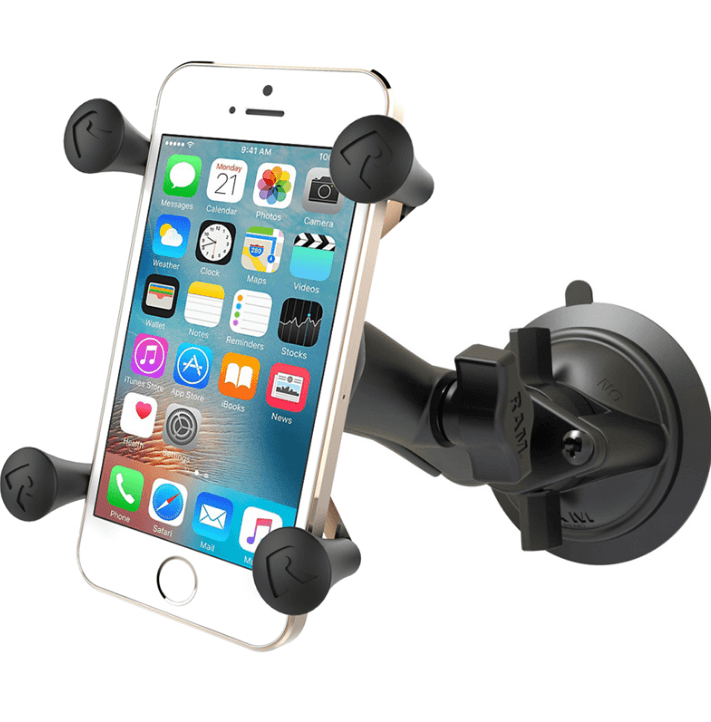 The perfect complement to the modern sleek interior of today's vehicles, the RAM X-Grip® is the cell phone cradle evolved.